The Tattoo MediaPad marks Globe Telecom’s foray into the booming tablet market. 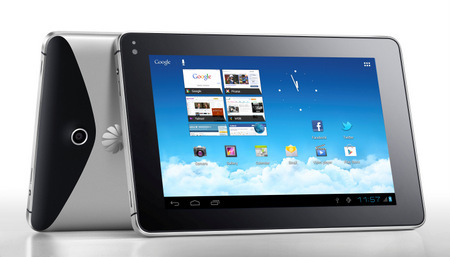 Manufactured by Huawei, the MediaPad perfectly complements the Globe’s mobile broadband services. This nifty device packs a mean punch, boasting a fast 1.2GHz processor, impressive 7″ display, HD playback, 8 gigabyte expandable storage and a 5 MP rear camera, fueled by the Ice Cream Sandwich Android OS and contained in a sleekly constructed aluminum body. Previously launched in the Philippines early this year, the MediaPad was initially sold at P21,990 under the Huawei brand. Despite its nice set of features, I’d say it’s a pretty high price to pay for a tablet that belongs to a relatively unknown brand considering the competition that is already out there. But after testing the Tattoo MediaPad for two weeks, I found myself using it more often than my Apple iPad due to its smaller size and portability. Work-related tasks can be accomplished on this device without compromise and often cumbersomeness that I find on the iPad. The great news is Globe Telecom is offering the Tattoo MediaPad at almost half the price at P10,990 (12mos. to pay at 0% interest) if you subscribe to their Tattoo Personalized Plan 999. This plan gives you fast unlimited browsing and a base speed of up to 7.2 mbps and a world of exclusive discounts and freebies from Globe. 1. Participant must be a resident of the Philippines. 4. To instantly gain five (5) entries, participant must write one (1) blog post about the Tattoo MediaPad and state why he/she needs the Tattoo MediaPad, as well as post information on the device and how to buy it paired with a Globe Tattoo data plan. A link to this blog post is required to qualify. 5. Each participant is limited to one (1) tweet and one (1) blog post, entitling him/her to a maximum of 6 entries. 6. Winner will be randomly drawn after two weeks on November 19, 2012. After creating your entries, please leave your complete name, email address and tweet/blog post URL in the comments. UPDATE: Contest is closed. Winner will be announced soon! Drew, kumusta naman ang battery life niya compared to Apple’s iPad? Thanks for the chance, Drew!